One of regenerative medicine's biggest goals is to develop new treatment options for patients recovering from a stroke. As of now, stem cell research for the disease has focused on developing therapeutic neurons, the primary movers of electrical impulses in the brain, to repair tissue damaged when oxygen to the brain is limited by a blood clot or break in a vessel. However, a new study by the UC Davis institution shows that other cells like astrocytes may be a better canditate for the task. 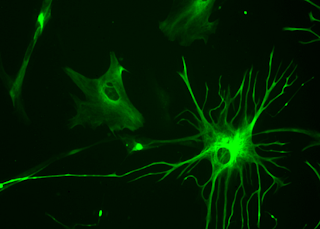 "Astrocytes are often considered just 'housekeeping' cells because of their supportive roles to neurons, but they're actually much more sophisticated. They are critical to several brain functions and are believed to protect neurons from injury and death. They are not excitable cells like neurons and are easier to harness. We wanted to explore their potential in treating neurological disorders, beginning with stroke." said Wenbin Deng, associate professor of biochemistry and molecular medicine at UC Davis and senior author of the study. To determine whether the astrocytes impacted behavior, the researchers used a water maze to measure the rats' learning and memory. In the maze, the rats were required to use memory rather than vision to reach a destination. When tested 14 days after transplantation, the rats receiving Olig2PC-Astros navigated the maze in significantly less time than the rats that received NPC-Astros or no treatment. "We were surprised and delighted to find that the Olig2PC-Astros protected neurons from oxidative stress in addition to rebuilding the neural circuits that improved learning and memory," said Deng. "Dr. Deng's team has shown that this new method for deriving astrocytes from embryonic stem cells creates a cell population that is more pure and functionally superior to the standard method for astrocyte derivation. The functional improvement seen in the brain injury models is impressive, as are the higher levels of BDNF. I will be excited to see this work extended to other brain disease models such as Huntington's disease and others, where it is known that BDNF has a positive effect. " said Jan Nolta, director of the UC Davis Institute for Regenerative Cures. "By creating a highly purified population of astrocytes and showing both their therapeutic benefits and safety, we open up the possibility of using these cells to restore brain function for conditions such as Alzheimer's disease, epilepsy, traumatic brain disorder, cerebral palsy and spinal cord injury," said Deng.